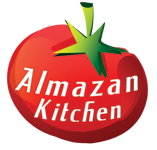 Hi and welcome to the Almazan Kitchen Blog! Do you want to know a really special way of making pizza? We can tell you! Come, sit by the fire and listen closely. The regular and most common way to make pizza is just heating and baking it from sides, but if you want to have very tasty, crunchy and hot pizza toppings – you need to bake it from topside too! Of course everything should be organic and homemade! 1 tsp. sugar, 1 tsp. yeast, 1 tsp. salt, everything goes into the bowl. Mix it well. Add 400g grano duro flour. Add 1.5 tsp olive oil and knead more. Cover cutting board with some flour to prevent from sticking (Do not forget, that Almazan Kitchen produces its own cutting boards and knives, made from elite steel and wood, with all love special for you). Put dough back into the bowl, cover with towel and leave in the fridge for 12-36h. Cover cutting board with some flour to prevent from sticking. Take 1/4 from the dough, attenuate it. Add 2 tbsp. tomato sauce, cover whole dough with it. Slice some homemade vesalica, add above the dough. Same do with homemade white cheese. Grate homemade waxed cheese and add it above the dough. Add 1 tsp. homemade extra virgin olive oil. Place dough to the oven, cover with cast iron cap and bake for 5 min. Now you know how to make a pizza serbijana, or just Serbian Pizza, crispy thin-crust, yummy and juicy toppings. Mich würde euer messer intressieren.